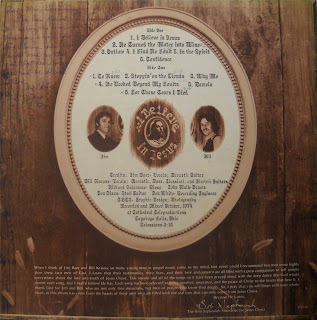 Light blend of electric folk and country interpreting ‘He Turned The Water Into Wine’, ‘For Those Tears I Died’, ‘Why Me’, Larry Norman’s ‘The Outlaw’, the title song to the tune of ‘I Believe In Music’ and others. Jim on acoustic guitar, Bill on acoustic, classical, electric and bass guitar. Others fill in on piano, drums and steel guitar. A couple Gaither and Crouch covers trade some of the folkiness for more traditional ground. Pleasant enough to keep I guess. Bill’s solo album Feel The Warmth is definitely worth checking out. (The Archivist by Ken Scott, 4th Edition). That kept Him on the run. Just to listen to this Man. And raised people from the dead. So they nailed Him to a tree. ‘Cause it’s time for us to leave.